More taste, less waste! Every single day in the UK, we throw out tonnes of perfectly good fruit. When we do that, we’re not just wasting the fruit that’s in front of us: we waste all the energy and resources that went into growing, processing, packing and transporting it. This is where our delicious protest comes in! We save surplus fruit to turn it into tasty snacks, packed with all the nutrition of flawless fruit. Every snack saves one apple or banana from going to waste! And there’s more to our fruit jerky and banana bars than saving fruit: they’re balanced snacks rich in both flavour and nutrients. We use simple, good quality ingredients to bring you the best snacking experience and fantastic nutritional value. Our snacks are vegan, gluten free, have no added sugar, additives or preservatives. Our commitment to sustainability goes far beyond surplus fruit too: we apply sustainable solutions to every aspect of our enterprise. We rescue fruit in the UK, make our snacks locally, and use highly innovative home compostable packaging to reduce packaging waste too. By buying our snacks, you’re making the delicious protest a reality: enjoying the delicious and nutritious fruits of our labour, and helping us save tonnes of fruit from going to waste. In a nutshell, you’re contributing to our mission to create more taste and less waste! 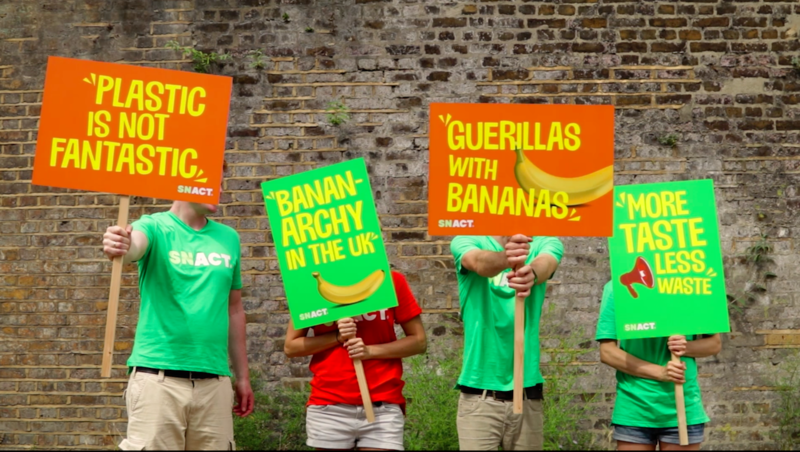 Are you bananas about the delicious protest yet? Become a Snactivist - join the #deliciousprotest today! They’re more and more available - and often cheaper too. Send us photos of your best finds! Have you tried baking banana peels yet? Seriously, that’s how you change the world! © 2019 GFT Retail UK Ltd All rights reserved. GFT Retail UK Ltd is a company registered in England and Wales. Registered number: 04543426. Registered office: Ormond House, 162 Park Close, Walton on Thames, Surrey, KT12 1EW.